Whither a Russian Student Movement? Recent outbursts of student activism are raising hopes for the emergence of a Russian student movement on the heels of the mass political protests of 2011–12. At the end of December, about 400 students occupied the Russian State University of Trade and Economics (RGTEU) in Moscow for over a week to protest controversial education reforms that would absorb their institution into another university. They barricaded themselves inside, and it took the intervention of a judge for the new dean to be admitted to his office. Although the action was ultimately unsuccessful (absorption of the university is going ahead in a push to reduce the number of public universities), it was the most visible example of student activism in many years, raising hopes for the emergence of a Russian student movement on the heels of the mass political protests of 2011–12. In an article in The Nation, Stephen F. Cohen called the occupation an “extraordinary new kind of protest” that was wrongly ignored by the American media. Some students claimed a moral victory in the struggle against a heavy-handed reform policy. “For a start, one result was that we were heard by a lot of people,” including supportive politicians and opposition leaders, said Maria Plastinina, an RGTEU undergraduate who spent two nights in the university during the occupation. Other activists and commentators have argued, however, that the story of the protest, which ended after the university’s dean led a vote to disperse, illustrates students’ lack of initiative. Was this the launch of a grassroots student movement against top-down reforms, or an act of self-preservation spearheaded by the faculty? The question of a student movement has gained resonance now that the Education and Science Ministry is drastically reforming—some would say “destroying”—higher education in the country. The reforms have already sparked several protests both in Moscow and in the provincial capital of Tambov. Following President Vladimir Putin’s comment at a meeting last summer that ineffective government universities should be identified and reorganized, Education and Science Minister Dmitry Livanov announced that the number of universities would be reduced by 20 percent and their affiliated campuses by 30 percent within the next three years. The ministry collected data from educational institutions for a “monitoring effectiveness” program and ranked them according to five criteria: total revenues, students’ average standardized admissions test score, amount of research commissioned, square meters of space per student and percentage of international students. On November 1, it published a list of forty universities (out of 541) and eighty-one affiliated campuses (out of 994) it deemed ineffective, including RGTEU. Meanwhile, the State Duma passed a sweeping education law on December 18 to further regulate and standardize elementary, secondary and post-secondary education. The legislation provoked picketing by school teachers and university staff and students, including an action group of students, graduate students and faculty from Moscow State University, who complained that it reduces the number of student stipends and removes the cap on dormitory costs. The law aims to slim down the sprawling post-secondary system, which has struggled with corruption in admissions and grading, to a smaller number of better-funded universities that can compete in international rankings. (The Higher Education World Reputation Rankings by the British newspaper The Times caused an uproar among Russian officials when not a single Russian university placed in the top 100 in 2012.) However, critics including educators, commentators and lawmakers worry that the new legislation takes yet another step toward higher tuition and the privatization of education at all levels, which since Soviet times has been widely attainable at little to no cost. According to Boris Kagarlitsky, director of the Institute of Globalization and Social Movements in Moscow, the ministry’s policy is designed to reduce access to higher education—54 percent of Russians age 25-64 have a university degree, the highest such proportion in the world—because such wide-reaching instruction is regarded as an unnecessary and even “dangerous” expenditure for the government. Both Kagarlitsky and professors in the philological department at Moscow State University, who began speaking out against the reforms in November, argue that the Putin regime aims to privatize higher education, excluding much of the populace without the ability to pay expensive tuition—and firming up its own grip on power. “This is not even a reform…. this is in fact the full-on, fully conscious destruction of the education system,” Kagarlitsky said. Already before the RGTEU occupation, university reorganization was provoking students to action in Tambov, an industrial city of 280,000 located about 300 miles southeast of Moscow. When the Education and Science Ministry decided in September to merge Tambov State Technical University into Tambov State University, students from the former institution took to the streets in protests that drew up to 2,000 participants, according to some estimates. In October, Livanov canceled his order to combine the two institutions. Then in November came the results of the effectiveness monitoring, the methodology of which was castigated by the dean of the Higher School of Economics and other educators. RGTEU Dean Sergei Baburin argued that data about his institution’s performance had been falsified. When the university was nonetheless slated in November for “reorganization,” Baburin sent an open letter to Putin with his complaints. The letter was never answered, despite regulations stipulating that appeals from citizens be answered within one month, according to RGTEU professor Leonid Dobrokhotov. Members of the student body started a group on Vkontakte, the most popular social networking site in Russia, called “RGTEU! WE WON’T LET THEM CLOSE OUR SECOND HOME” that would become their most important tool for organizing. Led in part by the student council, they went on to stage several actions in early December, holding protests in Moscow and at affiliated campuses against the monitoring results (replete with an effigy of the education and science minister that was burned), a picket at a Moscow monument commemorating the 1905 Revolution and an auto rally with cars streaming the university’s flag. Finally, December 18 to 20 saw the first phase of the “Night at RGTEU” occupation, which received coverage in major print, radio and television news outlets. After the Education and Science Ministry announced the decision to merge RGTEU into the Plekhanov Russian University of Economics (REU), students and some faculty members restarted the occupation on December 24, with several hundred camping out in the university. Livanov promptly fired Baburin, and the occupiers initially wouldn’t let in his replacement. Although opposition leaders Gennady Gudkov and Sergei Udaltsov visited the occupation and expressed their support, the action never took on a strong political tone, and hope continued to be placed in Putin and even Patriarch Kirill, the head of the Russian Orthodox church, to intervene on RGTEU’s behalf. Nonetheless, the protest did, just like the mass opposition protests, make strange political bedfellows: Gudkov has represented the social democratic A Just Russia party and Udaltsov is the leader of the socialist organization Left Front, whereas Baburin is a major nationalist political figure, having founded a nationalist party and served as a State Duma deputy. Furthermore, the furor did not spread to other universities slated for reorganization, even though some students and faculty from other places attended the occupation in solidarity, according to Dobrokhotov. Concern for the faculty also motivated students. As academic departments are merged, a large part of RGTEU’s teaching staff is being laid off, along with up to 90 percent of other staff, according to Andrei Gara, who was the university’s press secretary up until the reorganization. However, other student activists questioned whether the protest wasn’t primarily the work of self-serving university administrators working on an impressionable student body, and Kagarlitsky argued that the RGTEU occupiers needed “a push from above” to start protesting. Some activists doubt that the RGTEU occupation can serve as a touchstone of student opposition. “The Russian student movement continues to grow, but not by any means in light of the ‘uprising’ at RGTEU, fortunately, since there wasn’t any uprising there,” said Yelena Pasynkova, an activist at St. Petersburg State University. RGTEU undergraduates, on the other hand, have maintained that the uprising was student-driven, arguing that much of the media coverage skewed the general perception to the contrary. Nonetheless, faculty members exercised at least some leadership in the final stage of the protest: In a meeting with faculty on December 27, students took a 137-87 vote in favor of the dean’s suggestion to go on winter break rather than to continue the occupation, as another professor proposed. “The problem is that as soon as Baburin understood that he couldn’t hold his chair, he surrendered that point and stopped struggling, and at that moment the students also gave in,” Kagarlitsky said. This interpretation plays to the prevailing view among academics and activists that Russian students are passive and apolitical. It’s true that despite isolated outbursts like the RGTEU occupation, Russian undergraduates can’t boast the mass protests and political gains that their counterparts in countries like the Italy, Ireland and the UK have recently achieved. Whereas Russia’s retirees have resisted reductions in Soviet-era social benefits, taking to the streets to protest decreases in subsidies and pension payments, students have done comparatively little to fight the slowly rising costs of education. Even now, professors, teachers and graduate students have taken the lead in speaking out against the reform program. Although understanding the reasons behind the student situation is difficult, one factor may be that undergraduates often start working a steady job before finishing university, with the result that academic engagement becomes secondary to starting a career. Nonetheless, students have pulled off several small grassroots protests over the past few years in St. Petersburg and Moscow, some of them with an insurrectionary flourish: Last year, a trio calling themselves the “Tiananmen Witnesses” hung a banner from a rooftop calling for the dean of St. Petersburg State University to resign, and in 2011, students donned masks of presidential advisor Arkady Dvorkovich, who had proposed cutting stipends, and pretended to beat down fellow students. Campus activists argue that the protest movement is growing, and most recently, students marched in St. Petersburg on January 26 with demands ranging from free education to university self-administration. About 100 students attended, according to Viktor Vorobyov, chairman of the St. Petersburg branch of the Russian Student Union. “An attitude of protest and the willingness to do something is gradually appearing among students and teachers, and it’s noticeable,” said Pasynkova, who also attended the march. As the spring semester starts up in February, other campuses—especially those up for “reorganization”—may yet speak out in solidarity with RGTEU, as none have so far. At the very least, the occupation caught the attention of a country where the novelty and exhilaration of last year’s mass opposition marches in the capital have worn off. It received extensive media coverage in Russia, garnered the support of lawmakers and opposition leaders and sparked dialogue about a larger student movement, a phenomenon that hasn’t been seen in the country since the 1960s. 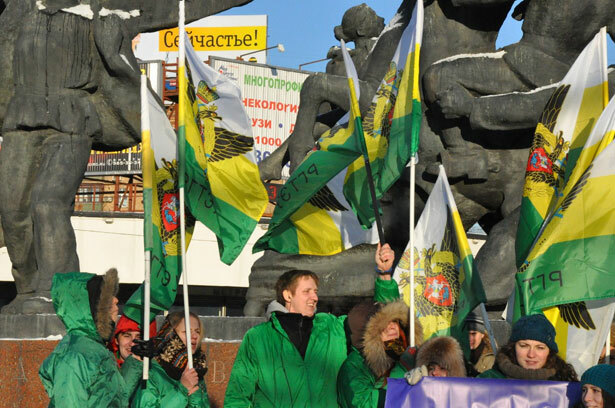 The protest in Tambov also raises the possibility that education reforms will spur activism and civic engagement in Russia’s regions, where most residents have little sympathy for the anti-Putin opposition movement in Moscow and St. Petersburg. The ground is growing only more fruitful for protest: As the reform process—and closure of universities—revs up, students will have no lack of issues around which to coalesce.